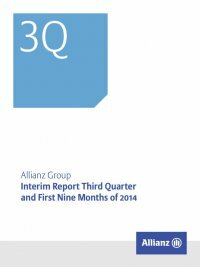 Interim Report Third Quarter and First Nine Months of 2014 Allianz Group58 4 – Segment reporting Identification of reportable segments The business activities of the ­Allianz Group are first organized by product and type of service: insurance activities, asset management activities and corporate and other activ­ities. Due to differences in ­the nature of products, risks and capital allocation, insurance activities arefurtherdividedintothebusinesssegmentsProperty-Casualtyand Life/Health. In accordance with the responsibilities of the Board of Management, each of the insurance business segments is grouped into the following reportable segments: −− German Speaking Countries, −− Western & Southern Europe, −− Iberia & Latin America, −− USA, −− Global Insurance Lines & Anglo Markets, −− Growth Markets, −− ­Allianz Worldwide Partners (Property-Casualty only). Asset management activities represent a separate reportable seg- ment. Due to differences in the nature of products, risks and capital allocation, corporate and other activities are divided into three reportable segments: Holding & Treasury, Banking and Alternative Investments. In total, the ­Allianz Group has identified 17 reportable segments in accordance with IFRS 8, Operating Segments. The types of products and services from which the reportable segments derive revenue are described below. Property-Casualty In the business segment Property-Casualty, reportable segments offer a wide variety of insurance products to both private and corporate customers, including motor liability and own damage, accident, gen- eralliability,fireandproperty,legalexpense,creditandtravelinsurance. Life/Health In the business segment Life/Health, reportable segments offer a comprehensive range of life and health insurance products on both an individual and a group basis, including annuities, endowment and term insurance, unit-linked and investment-oriented products, aswell­­asfullprivatehealth,supplementalhealthandlong-termcare insurance. Asset Management The reportable segment Asset Management operates as a global pro- vider of institutional and retail asset manage­ment products and ser- vices to third-party investors and provides investment management services to the ­Allianz Group’s insurance operations. The products for retail and institutional customers include equity and fixed- income funds as well as alternative products. The United States and Germany as well as France, Italy and the Asia-Pacific region represent the primary asset management markets. Corporate and Other ThereportablesegmentHolding & Treasuryincludesthemanagement and support of the ­Allianz Group’s businesses through its strategy, risk, corporate finance, treasury, financial reporting, controlling, communication, legal, human resources and technology functions. The reportable segment Banking consists of the banking activities in Germany, France, Italy, the Netherlands and Bulgaria. The banks offer a wide range of products for corporate and retail clients, with a pri- mary focus on the latter. The reportable segment Alternative Invest- ments provides global alternative investment management services in the private equity, real estate, renewable energy and infrastructure sectors, mainly on behalf of the ­Allianz Group’s insurance operations. The reportable segment Alternative Investments also includes a fully ­consolidated private equity investment. The income and expenses of this investment are included in the non-operating result. General segment reporting information Prices for transactions between reportable segments are set on an arm’s length basis in a manner similar to trans­actions with third parties. Transactions between reportable segments are eliminated in the Consolidation. For the reportable ­segment Asset Management, interest revenues are reported net of interest expenses. Financial infor­mation is recorded based on reportable segments. Cross-seg- mental country-specific information is not determined. Reportable segments measure of profit or loss The ­Allianz Group uses operating profit to evaluate the ­performance ofitsreportablesegmentsandthe­AllianzGroupasawhole.Operating profit highlights the portion of income before income taxes attribut- able to the ongoing core operations of the ­Allianz Group. The ­Allianz Group considers the presentation of operating profit to be useful and meaningful to investors because it enhances the understanding of the ­Allianz Group’s underlying operating performance and the com- parability of its operating performance over time.